Could this be a significant reason why the economy is not rebounding in Canada? 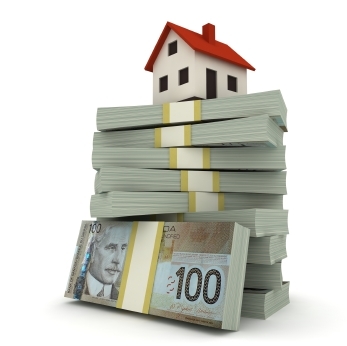 Could having to save big money for a down-payment be a big reason why the economy in Canada is not rebounding? In the last 5 years or, house prices in Canada have gone up dramatically, especially in major cities like Toronto and Vancouver. This got me thinking: could it be that so many people are saving for a down-payment , and as a result, they don’t spend this money on other things that would otherwise revive the economy? If you notice, house prices started becoming more and more unaffordable just as the world economy was emerging from the recession in 2008. While Canada escaped the recession with little pain, it hasn’t been that great ever since. The unemployment situation is never stable, going up one month, only to go down the next month and so on. The same with the GDP; it is barely going over 2% for this year so far. I know there are many other factors (including the large amounts of cash being hoarded by corporations) but when it comes to personal finance, how much is ‘saving for a down-payment’ hurting economic activity? And as we all know, with house prices being this high, the DP has to be a large sum. If the average house price in the GTA is around $500,000 and since the longest amortization period you can now do is 25 years, then really, to afford the monthly payments, the lowest amount you should put for DP is $75-100K. And even then, you are still looking at a mortgage of at least $400,000 over 25 years: even given today’s historically low interest rates, you are looking at a high monthly payment. Therefore, people looking to buy a house have to save for years and years, to come up with a good amount for a down-payment. 10-20% is a good amount. If you have even 200,000 families saving for a down-payment at any one time, allocating an average of $750 a month, you are looking at $150,000,000 in money that is being saved and not spent every month. That is $1.8 billion a year of lost economic activity. To some it may seem like a drop in the bucket. But $1.8 billion is a large sum of money any way you look at it. It could easily create some momentum in the economy and the spinoff effect will be significant.